Super Savings Item! Free Shipping Included! Save 34% on the Bird-X Stainless Steel Bird Spikes, Covers 100 feet by Bird-X at Halo Grow Box. MPN: STS-100. Hurry! Limited time offer. Offer valid only while supplies last. How It Works High quality Stainless Bird Spikes are 100% effective at preventing pest birds from landing, nesting, or roosting on selected surfaces. 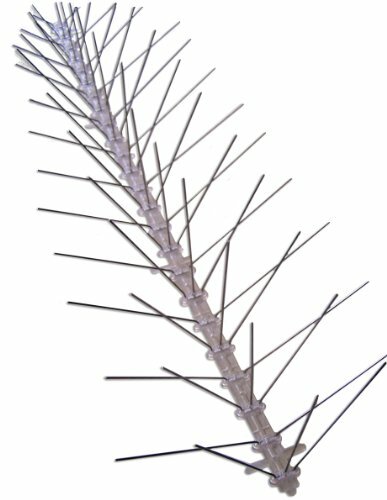 High quality Stainless Bird Spikes are 100% effective at preventing pest birds from landing, nesting, or roosting on selected surfaces. By installing the spikes on surfaces where pest birds like to perch an uninviting, irritating, & intimidating barrier is established, forcing them to relocate. Stainless steel spikes are humane and only require a single application for years of efficacy. Stainless Bird Spikes effectively repel pigeons, sparrows, starlings, crows, blackbirds, grackles, & swallows amongst many other pest birds. Stainless Bird Spikes are effective wherever they are applied such as homes, garages, rooftops, windowsills, signs, billboards, ledges, playgrounds, beams, yards, gardens, gates, fences, barns, & more. Installation for Stainless Bird Spikes is easy and can be done with bird spike adhesive, nails, screws, or ties. The flexible base of the spike strip allows these spikes to be installed on straight, curved or uneven surfaces. When applied correctly, Stainless Bird Spikes are 100% effective in repelling birds 24/7. Quality can last a lifetime with stainless steel material that won’t corrode or decay, purchase of this product includes a 10 year manufacturer’s warranty. This set includes 100 feet of stainless steel spikes that measure 4.5” deep (for 5” effective depth coverage), sent as 50 two-foot linear segments. If you have any questions about this product by Bird-X, contact us by completing and submitting the form below. If you are looking for a specif part number, please include it with your message.